Charles Woodson has dogged opposing offenses since he emerged on the NFL scene in 1998. Collectors have waited just as long for another certified autograph to appear from him. He signed his 1998 Bowman Chrome rookie cards, but no readily available cards since. 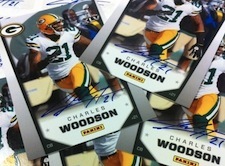 The wait has ended with the news that Woodson has finally agreed to do autographs for Panini. The signed stickers will be used in several 2011 NFL Panini products. Woodson also autographed five cards from the Super Bowl XLV NFL Experience that will be included in 2011 National Treasures Football. The former University of Michigan Heisman winner spent his first eight seasons with Oakland after being selected fourth overall by the Raiders in the 1998 NFL Draft. Woodson signed a free-agent deal with Green Bay in 2006 and has been with the team ever since. The elite cornerback has been named to seven Pro Bowls and was the 2009 Defensive Player of the Year.